Give your hair that salon finish every day with the ghd hair brush range. 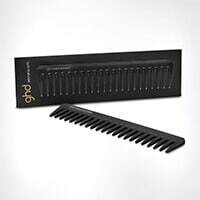 From creating lift when blow-drying or adding some final touches to your updo, a ghd hair brush is the ultimate essential to help style and maintain your look. Take care of your hair and create stunning styles with our professional brushes. 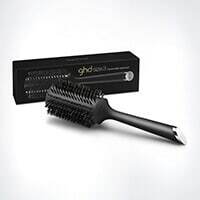 The ghd narrow dressing brush with natural bristles can help tame any stray hairs or for adding gorgeous volume with kinder-to-hair backcombing, whilst the tapered soft-touch handle is perfect for sectioning hair and creating unstoppable hair height. For a professional finish, the ghd paddle brush is the ultimate tool for detangling your hair without the static, allowing you to create a smooth and stylish look. 100% recommended for all hair types it’s an incredible brush. After discovering this hair brush I’d never buy any other for my hair. It’s perfect for mid to long hair. It seems to go through my hair without the dragging and pulling that I get with other brushes. My three daughters also have long thick hair like mine and we all have our one. Very pleased with my purchase, a good size for short hair. This product has been a pleasure to use. The brush is as described and helps to give lift at the roots. It separates the hair well initially and leaves it visibly fuller. My only adverse comment is its balance. Somehow if it is put near the edge of a surface the length/weight of the handle cause it to fall to the floor easily. However I am pleased with my purchase. This comb has significantly reduced the amount of hair lost when I comb through my hair after washing. I'm experiencing post partum hair loss and also hair breakage sadly. I'm sure there are cheaper products on the market but I'm glad I invested in this one as it doesn't pull or drag my hair and detangles knots with ease. Just wish I'd done it sooner. Best hairbrush I have ever bought! I have had many brushes in my time when have all been adequate but this one sets the bar high. When I use it while drying, it glides through my hair and doesn't leave me with fly away hair. I love it but the down side is I have had to hid it from my two teenage daughters. This size brush is ideal for blow drying my medium length hair. It has a long handle which makes it easier to use. It achieves a sleek and smooth result. The brush came in a bigger box the. 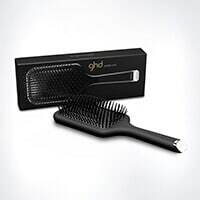 A smaller ghd box containing the brush, the smaller box was bashed and of an extremely low quality which hadn't been done during postage as the outside box had no marks. Then when opening the packaging the brush contained marks and cuts down it's handle, this was not the quality I expected from GHD. 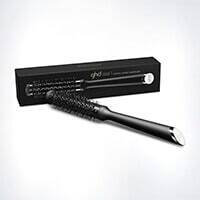 Although when using the brush it provides an extremely sleek and smooth finish to any long haired blow dry and is easy to hold and use which is brilliant. This is the best round brush I have used. I have tried several others and this out performs them all. The natural bristles don't pull my hair at all and they give my hair a really smooth finish. My hair is above my shoulders and the size of this brush is perfect. The size measured across the front of the barrel including the bristles is about 2.75 inches. Great quality, great performance, highly recommend. THIS IS MY THIRD BRUSH FROM GHD, I BOUGHT 2 CERAMIC BRUSHES BEFORE AND I LOVED THEM, AND I LOVED THIS TOO. GHD IS GREAT QUALITY, THEY LAST LONG, THAT'S WHY I BUY FROM THEM. THIS BRUSH LEAVES MY HAIR SUPER SOFT, I FELT IN LOVE WITH THIS BRUSH, GOOD PURCHASE!, I'M SUPER HAPPY WITH MY BRUSH. The brush itself is great, looks great and helps tame my frizz as I blow dry. However, the handle is too thin and it’s hurts my hand!! I’ve seen other reviews saying the same thing too. GHD please make your handles thicker! I am unable to pull the handle down as much as I would like to, it also means that I have to use smaller sections of hair and therefore my hair takes longer to blow dry. Honestly one simple fix would make this brush 5* but unfortunately the handle lets it down. I bought this brush as part of my daughter's Christmas present, together with the size 2. She had requested some decent hairbrushes to help style her new hairstyle. 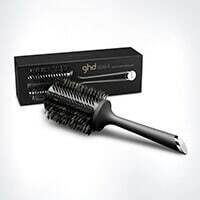 As I already owned a GHD brush, I knew they were well made. There was an added bonus of the free small bag with my purchase.